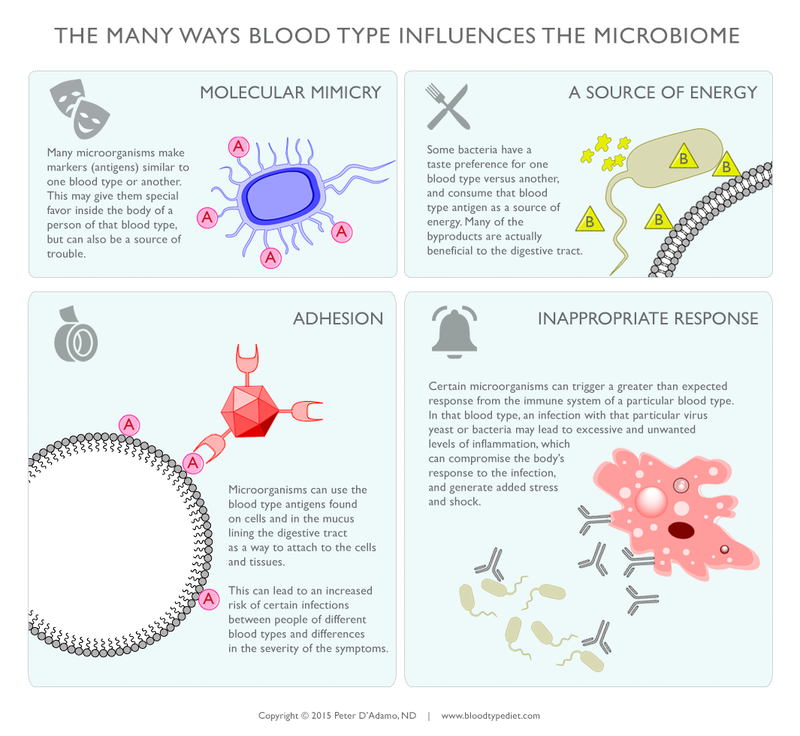 Editors note: This is the 2nd installment of a 2-part series by Dr. D'Adamo exploring the connection between blood types and the microbiome. Read part 1 of the article from our May 2015 issue. Although the average physician does not consider blood type antibodies beyond their role as a transfusion nuisance, common sense dictates that they serve a more basic role; natural selection obviously can not predict this type of need, despite its obviously life-saving benefits. Instead these antibodies work in combination with the antigens to create a molecular and immunologic 'line in the sand,' allowing microbial species with similarity to the antigen to avoid immune reaction, while targeting dissimilar strains for destruction. A large percentage of microorganism share antigenic similarity with the ABO blood type antigens, which in themselves are nothing unique or special to humans. Thus, if you are a critter who has developed a similar antigen to the blood type A antigen, you'll probably do fairly well in the gut of blood type A humans. On the other hand you are probably going to have real difficulties should you find yourself inside the body of a type B, as they carry antibodies (extremely powerful ones, by the way) to type A and will not like you very much at all. Many studies have associated increases in the blood type antibodies during many common infections, and the ability of type O to manufacture both anti-A and anti-B antibodies may have given them a real advantage when it came to natural resistance to many pathogenic bacteria and viruses. However, similarity between your blood type antigen and the antigens on a microbe are no guarantee of future harmony. Just as an uninvited guest can sometimes get past the nightclub bouncer by claiming that 'I'm with the band,' microbes with ill-intent can evade the basic defenses by developing the ability to mimic the blood type antigen of their potential host/victim. Just as in Star Trek, this 'cloaking device' gives them a degree of invisibility from the immune system. In one study, bacteria antigens that cross-reacted with blood group antigens were detected on cell walls of anaerobic bacteria from 30% of the cultures inoculated. Other microbial felons may have an advantage due to their possessing specialized ways to attach to the blood type antigens in the gut, which makes infection much easier. Many of these 'molecular suction cups' are adhesive-type lectins, a class of proteins also found in many foods. Consume adequate levels of different kinds of fiber - one option is using ARA6, which provides high levels of two kinds of nourishing soluble fiber. Butyrate is a short chain fatty acid normally appearing because of colonic fermentation of fiber in the gut. Butyrate is a preferred source of energy for the cells of the intestinal lining, and several studies suggest that it is the effect of butyrate that actually gives dietary fiber its cell-supporting properties. 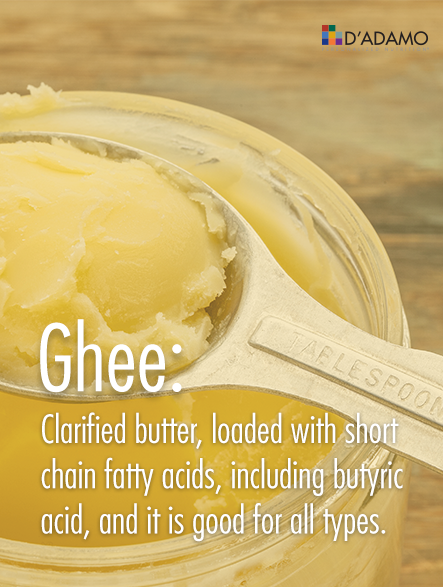 Ghee, an Ayurvedic preparation of clarified butter, is loaded with short chain fatty acids, including butyric acid, and it is good for all types. Place the butter in a medium saucepan over medium-high heat. Bring the butter to a boil. Once boiling, reduce the heat to medium. The butter will form foam, which will disappear. Continue cooking. Once the butter forms a second foam, the ghee is done. Gently pour the ghee through cheesecloth or a fine mesh strainer to remove the milk solids that formed at the bottom of the pan. Store in an airtight container, and keep it away from moisture. It does not need to be refrigerated, and it can last for about a month. What is Ghee? It is basically butter that has the milk solids and water removed. According to Ayurveda, Ghee (clarified butter) is the best oil for cooking. This is because when used in moderation it stimulates the digestion (Agni) better than any other oil. Give it a try! It is very tasty and without the side effects of plain butter. Note: Ghee does not require refrigeration if you keep moisture out of it; for example, don't dip a wet spoon into the ghee jar. 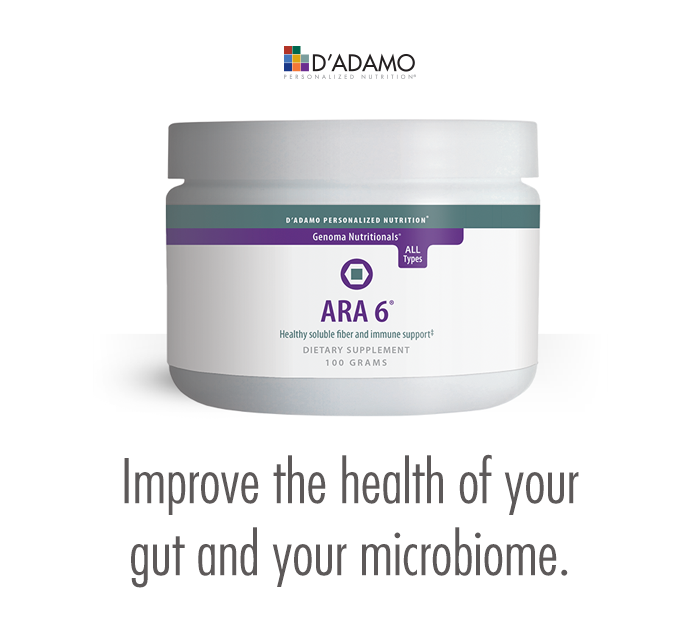 If you want to get your butyrate in supplement form, our ARA 6 product will increase butyrate concentrations in the intestines, and Intrinsa is a butyric acid and caprylic acid formula with larch, and these two products support healthy stomach, intestine, and colon function. Here's a great reminder about mosquitoes, particularly as we get into the summer season in the US. Research shows that they make their choice of victim by blood type and secretor status. Blood Type O/Secretors had a higher landing rate of mosquitoes (83.3%) than Blood Type A/Secretors (46.5%). B's fell somewhere in the middle of O and A. Wear light colored, long pants and sleeves when going into heavily forested areas or when by standing water. Dusk and dawn are two particular times that mosquitoes like to graze, so be extra cautious at these times. Genetics holds a clue to determining what exactly attracts the mosquitoes to one individual over another, whether it is blood type, body odor, uric acid levels, body smells, so that one day soon we'll each have our own, personalized mosquito repellents. Until then, keep covered and alert, and use natural repellents that contain citronella, lemon eucalyptus, rosemary, lemongrass, or cedar oil. Every June, we have an opportunity to think about those significant men in our lives and how they've helped to shape and form who we are. Although my father passed away over 20 years ago, his character – his essence, so to speak – persists, whether it is in the piece of furniture that he restored which we have in our home, the blooming peonies and my memories of his garden, in quirky habits our daughters have that have some genetic connection to him, or in the very simple and moral way he lived his life. We sail with a clear purpose and happy hearts on our new venture into the sea of life. That sea is not calm, but is disturbed by economic storms, which we must battle. Some of us will seek to further our educations; others will enter some occupation; whatever we may do, the training, which we have received at Technical High School, will pilot us safely through these storms. This is as true today as it was back then, and it is not only limited to those who graduate. Embarking on any new journey, whether it is education, a new job, relocation or a new lifestyle requires that we draw upon all the resources we have as we make that transition. Set high standards for the students in the lower classes, and remember to maintain those set by those who came before us. In doing so, you may pass this mantle to your successors, untarnished as you have received it. The call to lead and to set standards is as appropriate today as it was in 1937. Our world needs this – globally and locally -- and it is hard to conceive of what the world would look like if each one of us lived our lives this way. This is the blueprint for radical transformation! In later years, when I brought Peter home to meet my parents, my father met a kindred soul -- a fellow traveler, engineer, artist, geek (although we didn't have that word at the time). A man who loved music and circuit boards, who could delight in solving a tricky engineering problem as much as weeding a garden. They shared a deep and wonderful connection, and I was privileged to witness their friendship blossom, trading stories, learning from each other and at the end of the day, sharing a laugh and a beer. This June, I'd like to pick up the mantle that has been passed on to me and honor the spirit of my father and all the men in our lives, who inspire us and want us to be better people. I was fortunate to have my dad, and my good fortune continues as I have Peter as my partner, my best friend, the father of my children and the love of my life. He continues to inspire me and encourage me to be my best self, and I am truly grateful. 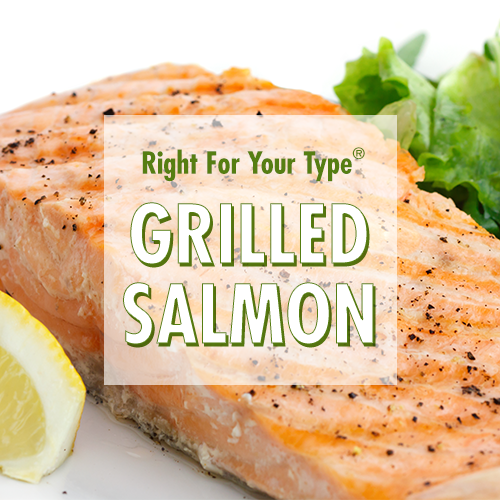 Grilled salmon is a summertime favorite, and it works well for all blood types. We've suggested an easy marinade that makes dinner prep tasty and easy. Finely chop the garlic and shallot, mix with olive oil and lemon juice. Marinate the salmon steaks in the mixture for 1 hour prior to grilling. Grill on medium heat about 4-8 minutes on each side, being careful not to burn or char the fish. Test with a fork for desired firmness. Whisk lemon juice, olive oil, mustard, honey, and sea salt, to taste, in the bottom of a large bowl. Set aside. Cut tough bottoms off the kohlrabi as well as stems coming off the top, and peel outer layer. Grate the peeled bulbs into the bowl with the dressing. Cut bottoms and tops off broccoli stems, and peel and grate into the same bowl with kohlrabi. A food processor can also be used for grating. Add raisins and parsley, toss to mix, and coat with dressing. Serve chilled. TIP: Reserve broccoli and kohlrabi tops for later use. Sauté for 8-10 minutes over medium heat with 1 tablespoon olive oil and a dash of sea salt for a delicious side dish any night of the week. Whisk lemon juice, olive oil, mustard, honey, and sea salt in a large bowl, and set aside. Remove tough bottoms from cabbage as well as the outer layers. Using a food processor or a hand grater, grate peeled cabbage, and add to the bowl with dressing. Cut bottoms and tops off broccoli stems, peel, and grate. Add broccoli to bowl. Add raisins and parsley, and toss to combine vegetables with dressing. Serve chilled. TIP: Reserve broccoli tops for a fast and delicious side dish: mix with 2 teaspoons olive oil and a dash of sea salt; roast in oven for 20 minutes.